Happy anniversary to Steve, Husband Extraordinaire! And to me, of course, because he wouldn't be having an anniversary without me. Today marks 14 years since we got married. And a wonderful 14 years it's been! There are a lot of reasons to love Steve, but one of the sillier reasons I love him is because he tolerates my love of taking bad selfies of us together. I don't use the screen like normal people do to make sure they're actually in the frame. Which leads to some funny photos where we're not in the frame. I laugh every time I see this photo of his mouth and my right eye. I didn't realize the camera was zoomed in; I'd been hoping to capture the beautiful forest and falling snow in the background. You can see some snow in my hair, but that's it. 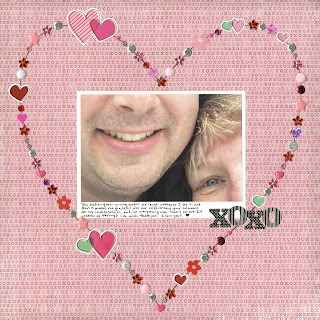 There were two National Scrapbook Day challenges that inspired me to make this layout. The first was a scraplift challenge. This page by Melinda Spinks was my jumping-off point. The second source of inspiration was an embellishment challenge. I don't use a lot of embellishments in my scrapbooking and almost never use anything dimensional, so this really was a challenge for me. And it was so much FUN! I love how the page turned out and am so happy to have it in the album. Super great job w/ the scrap lift! Happy anniversary!!!!!!!!!! And LOL!! I loveeeeee that selfie!!! Too FUN!!!! GORGEOUS lo too! LOVING the big heart!!!!!!!!! Hehe...love your fun selfie! Happy Anniversary to the both of you!